The HBO Bryant Park Summer Film Festival presented by Bank of America makes its triumphant return to the park on Monday with a screening of Ghostbusters (1984). Here is everything you'll need to know for this upcoming Monday evening (and nine Mondays thereafter). 1. What movies are showing? See the full list and descriptions here. 2. When should I get there? The lawn is closed all day on Mondays so the grass can rest, in preparation for the thousands of guests who come for the film. (Read more on our grass maintenance philosophy here.) The gravel around the lawn opens at 4pm, and the lawn opens at 5pm sharp. The rush of people onto the lawn at 5pm is a sight to behold. 3. What is the capacity of the lawn and how quickly does it fill up? How quickly the lawn fills up depends on the evening's movie and the weather, but we can fit a LOT of people on the lawn – thousands! If you’re worried about getting a spot, we recommend getting there early, within an hour of the lawn’s opening at 5pm. Some early birds and arrive in time for the lawn opening. 4. What time do the movies start? Every week at the Film Fest, we wait for the sun to set so that the movies are visible. The show starts 30 minutes after sunset. Earlier in the summer, the sun sets later. This means June movies may not begin until 9pm, while August movies begin a little after 8pm. 5. How do I access the lawn? There are multiple entrances around the lawn’s perimeter. The lawn is wheelchair accessible via several entrance ramps to the park, and a fantastic unobstructed view from the Upper Terrace. 6. What can I bring to the Film Fest? Food, friends, and a blanket to sit on! Some people bring board games, books, and knitting projects to entertain themselves as they wait for the films to start. 7. What shouldn’t I bring to the Film Fest? Lawn chairs from home aren’t allowed on the lawn, as they block the view of those behind you. Plastic tarps and pets are both prohibited on the lawn, as they damage the grass. Alcohol and smoking are banned from all NYC parks. For the safety of film fest attendees, all bags are subject to search upon entry. 8. I hear there's popcorn at the Film Fest. Is it really free? You betcha, thanks to our generous sponsors at Bank of America. Vendors at Hester Street Fair serve a variety of snacks and sips. 9. Can I buy food in the park? Yes, delicious food! 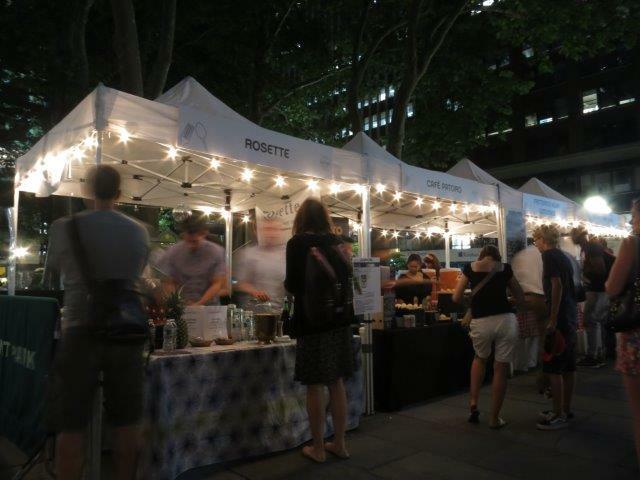 Hester Street Fair returns to the Film Fest this year, dishing out a variety of tasty options. The fair is open from 4pm until the film begins. You can also visit our food kiosks: Le Pain Quotidien, Wafels & Dinges, and Breads Bakery. In the next several weeks, we expect our COFFEED kiosk and Southwest Porch to open for business. 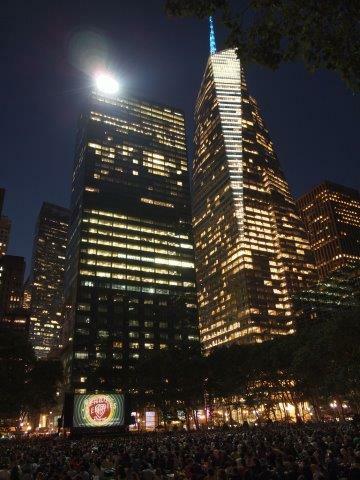 And, of course, Bryant Park is surrounded by a variety of restaurants and food options. 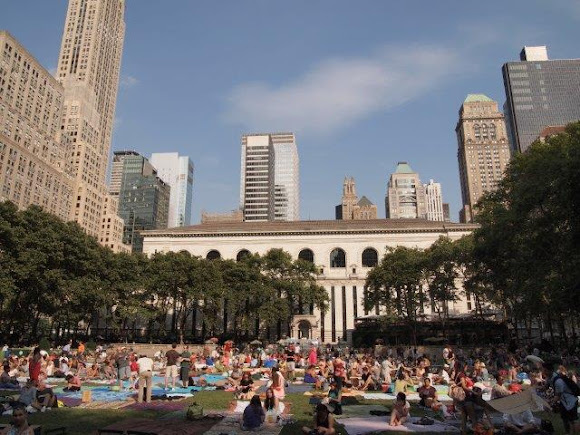 The award-winning Bryant Park restrooms are located by the Upper Terrace, but these are ladies-only after 7pm. There are porto-san restrooms along 40th Street for the Film Festival. Wear your wetsuit! We try not to cancel unless the downpour is absolutely torrential. For reference, we haven't cancelled a film in nine years.